Getting paid as a contractor or consultant is different from being an employee. It’s not just about being paid a salary anymore. As an owner of a limited company, you can maximise your tax efficiencies by paying yourself a blend of salary and dividends so more of the money your company earns ends up in your pocket. What elements do you need to think about as the owner of a limited company when paying yourself and others? in your earnings. That means you need to ensure your payroll and accounting system has this functionality. If you have additional shareholders or employees, you are running a larger payroll operation but essentially the principles are the same. Salary – a regular payment (usually monthly) from employer to employee (from your limited company to you in this case). This is part of your business expenses and is allowable for corporation tax. Dividend – a distribution of company profits to shareholders. Dividends are released AFTER corporation tax is accounted for on the company profits. Expenses – personal expenses are reimbursement of expenses paid from personal funds on behalf of the company or mileage payments for business use of your personal car. E.g. subsistence and other allowable business expenses. Corporation tax – the tax paid by companies on their profits. Why use a blend of salary and dividends? As a limited company owner you can minimise your overall tax liabilities by paying yourself using a blend of salary and dividends. You need to ensure that when you incorporate your limited company that you are a shareholder as well as a director and employee. Your salary is classed as a business expense, reducing your overall company profit and therefore reduces your corporation tax bill. Setting your salary at the right level will minimise your personal tax liabilities (National Insurance Contributions (NICs) and Income Tax). Any further income you want to take is done best in the form of dividends. The Corporation tax that dividends attract is less than the potential NICs and Income Tax that an equivalent salary would attract. Dividends do not form part of your payroll function. Taking a salary from your limited company involves running a payroll. A payroll is the company’s record (and physical distribution) of pay to its employees. The payroll enables you to pay salaries and expenses, plus ensure that the deductions due (PAYE and NICs) are calculated and most importantly you comply with HMRC RTI requirements. When selecting a payroll system, it needs to be able to handle your personal requirements such as the ability to flex your salary, pay on selected dates, produce payslips plus produce and send the relevant RTI details to HMRC. When setting up your payroll function you need to set your salary (and that of any other employees), and think about how you want to administer business expenses incurred and paid for personally. The PAYE and employee NICs applicable to your salary are deducted from your salary throughout the year and paid to HMRC by your company. Your gross salary and employer’s NICs are allowable as a business expense, reducing your corporation tax bill. In the majority of cases setting a small salary for yourself is the best option as it minimises your tax liabilities. Setting a salary of £8,632 to £12,500 (using the 2019/20 tax threshold figures) is the most tax efficient salary as no income tax is payable and your NICs remain up to date. It is worth noting that for some, a higher salary may be beneficial – some lenders still insist on using salary rather than income in their lending criteria for example. Your salary is then divided across the year in monthly instalments. Some contractors and consultants prefer to flex their salary up and down in line with cash flow, ensuring that the annual salary figure is met by the financial year end, but the majority set their salary as a fixed figure each month. Business expenses are an essential part of any business. The earlier guide on business expenses details types of allowable business expense and how to manage them effectively. The majority of business expenses should be paid for using the company bank account, but there are certain expenses where this is not possible and this is when the expenses need to be claimed back from the company. Examples of these are utilities use (proportion of home utility bills attributed to the business for a home office) and mileage. The best way to account for this type of expense is to record it as a business expense that you have paid for personally and then reimburse yourself using your payroll scheme. Distributing dividends is the second core element of paying yourself from your business. Because dividends are a distribution of company profit they need to be distributed after corporation tax has been accounted for, but they do not attract NICs and they attract lower income tax rates than a standard salary would. So after the company pays 19% Corporation Tax, typically you will be able issue dividends using your remaining profit. On the first £2,000 of dividends issued you will not have to pay any income tax as this is your dividend allowance for the tax year. For any additional dividends issued above this amount, if they are within your basic rate threshold for your personal income* you will pay 7.5% and if you are a higher rate tax payer (with a personal income* of more than £50,000 in the 2019/20 tax year) then you will pay 32.5% income tax on the dividends issued. Please note: other income does not include reimbursed expenses. The tax to pay on income (including the dividends you pay yourself) is calculated at the end of the tax year via the self-assessment tax return and paid by the individual personally. You will need to make provision for the income tax on your company’s income at the end of the year calculated through self-assessment. This is due to be paid by 31 January in the following year. =Maximum dividend available for distribution to shareholders. If you plan to distribute dividends throughout the tax year, it’s prudent to allocate and save funds to cover the Corporation Tax due. Some businesses separate their savings from their working business bank account using a savings account in their company’s name. Retain a durable copy of the minutes. For more detailed information on when and how to pay yourself dividends you can refer to our dividends article. Take some time to ensure that you set the correct salary level and dividend payment mix for your personal circumstances. Set a date for your salary that fits with your monthly cash flow. Release dividends when you have the profit available to do so – take into account upcoming liabilities as well as the Corporation Tax due. Make provision to settle your tax liabilities – retain cash within the business to settle your corporation tax liabilities and retain personal savings to settle your dividend income liabilities at the end of the tax year. Retain all your financial records for a period of at least six years in case HMRC ask for auditable evidence. In the next instalment of this series we’ll cover more on making financial provisions. To receive a notification when this article is available follow us on Twitter @inniaccounts or LinkedIn. I am a director of a small LTD Company. I would like to start paying myself on the payroll and the rest dividends. I have registered etc with HMRC to do this and have their free payroll tool. Can I ask how to go about paying myself? Do i just pay myself monthly from my business account to my personal account and then tell HMRC how much was paid? is there a free software to create payslips? Do i need a P45? It has been over 9 years since i worked for anyone else. When paying yourself a salary form your own limited company you need to have raised payslips otherwise any funds transferred will be considered a directors loan. If you are not leaving any other role then you can be considered a new starter for your limited company in terms of payroll. 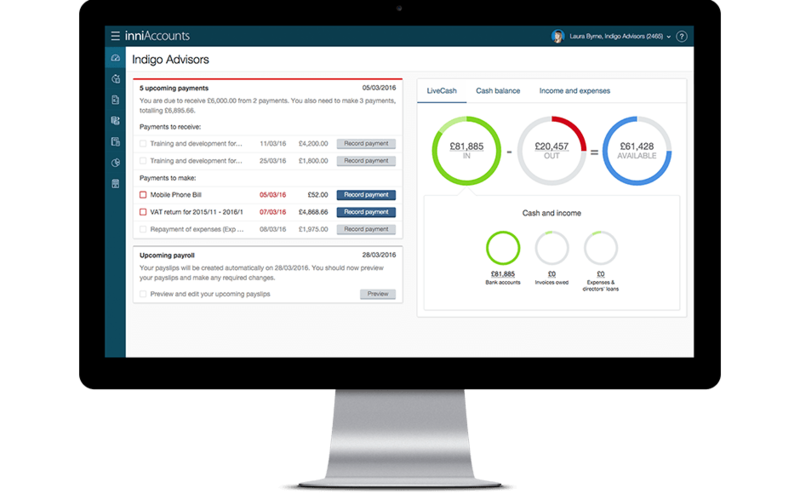 HMRC’s free payroll tool may allow you to generate payslips, however our software has a dedicated payroll section allowing our clients to manage payroll hassle free.